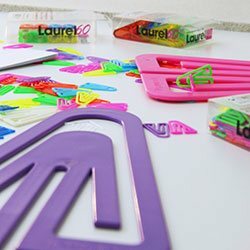 Full of energy and innovative creativity, and with new products, great customers and exciting tasks, we’ve made Laurel what it is today: a modern and innovative company offering premium “Made in Germany” quality. We take our responsibility to the environment seriously and attach great importance to handling resources responsibly and sustainably. Customers love us for our passion and competence, and for the fact that we repeatedly surprise them with new ideas – and set new trends with our practical, ingenious and bright and cheerful office products. With unbridled ingenuity, we design products which open the door to a whole new world of diverse and creative uses. In our Office Special, we’ve compiled a range of products which no office should be without. Visit our Trend Products category to discover how to skilfully set the stage with trendy products. Or click on our Good Ideas page, where we think outside the box and introduce original and practical ideas for using our products. You can also use Laurel products for innovative advertising.